A piece of land of almost 300 acres on mainland Penang, held for over 60 years by a group of friends, has been put up for sale. If sold, this tract with development potential could fetch more than RM300 million. Located in Kampung Ladang Sempah, Sungai Jawi, the land is just 20km from Penang’s second bridge — Jambatan Sultan Abdul Halim Muadzam Shah — and 500m west of the North-South Expressway. The owners recently appointed real estate agent Knight Frank Malaysia as their exclusive agent to seek a buyer for the freehold tract. According to Knight Frank’s property brief, the asking price is RM25 per sq ft, which means the 292.37 acres or 12,735,637 sq ft could be sold for as much as RM318.4 million. “This tract is one of the few in the area to become available now,” Knight Frank managing director Sarkunan Subramaniam tells The Edge. As an extension of Penang island, Seberang Perai has been experiencing a real estate boom in the past few years, driven by the scarcity of development land and soaring property prices on the island. Developers and investors have been focusing on the area as an affordable alternative, and the opening of the second bridge has been an added impetus for its development. Coming up in Seberang Perai are projects by Aspen Vision City Sdn Bhd, Eco World Development Group Bhd and IJM Land Bhd, among others. In fact, the 300-acre tract, called Ladang Sempah or Sempah Estate, is a mere 3.5km from IJM Land’s project, Senjayu, and 18km from Aspen Vision City, which has gained in popularity because of IKEA’s presence. The ownership of Sempah Estate can be traced back to the 1960s when four friends bought it. Then in the late 1960s, they invited a fifth friend to join their partnership. The newest partner subsequently took over the running of Sempah Estate and continued to do so for 42 years. The original four partners have died while the fifth partner, who retired some years ago, is now 93. “The younger partners [who inherited the land], many being professionals and dispersed over the world, are not keen on running the estate,” says Knight Frank Penang executive director Tay Tam when asked why the land was up for sale. The fifth partner also sold a parcel to the Bukit Jawi Golf Resort, which makes up a portion of the golf course. Sempah Estate is currently planted with oil palm but the land is zoned for residential, commercial and agricultural use. The permissible density is 11 to 30 units per acre, which is subject to the payment of development charges. As for other developments in Seberang Perai, it is noteworthy that Eco World signed two deals in June this year: one on the purchase of 300.07 acres from Batu Kawan Sdn Bhd for RM731.99 million or RM56 psf and the other on the purchase of 74.49 acres from Penaga Pesona Sdn Bhd for RM143.25 million or RM45 psf. Two projects — Eco Sun and Eco Horizon — are expected to be launched next year. To be built over 10 years, these have a total estimated gross development value of RM7.76 billion. In June 2013, Eco World had bought 50 acres off the Batu Kawan toll exit for RM40 psf. Eco Meadows, which has a GDV of RM918 million, is coming up on the land and is about eight years away from completion. 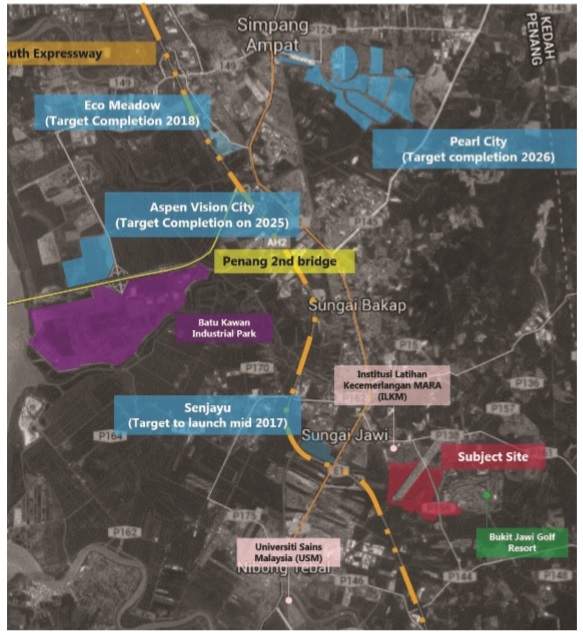 If a land deal announced by Tambun Indah Land Bhd in July 2014 — which was subsequently terminated — is anything to go by, the developer was keen on expanding its presence in Seberang Perai. It had planned to buy 209.54 acres (comprising 27 acres) of freehold land next to its Pearl City project in Simpang Ampat. At the time, the land price was RM150 million or RM16.43 psf. Pearl City, which is located 14km from Sempah Estate, is scheduled for completion in 2026. IJM Land, meanwhile, has purchased 70 acres for RM18.50 psf near the Jawi toll gate, where its Senjayu township will take shape. One of the most anticipated property developments in the north is Aspen Vision City, a joint venture between Aspen Group and Ikano Group. Swiss home furnishing company IKEA is expected to be an anchor tenant. Developed on 245 acres, Aspen Vision City is targeted for completion in 2025. Apart from the IKEA store, this development will boast a hotel, offices, retail outlets and Columbia Asia Hospital.